This is a special close to heart recipe that was the first that I picked from my Mother-in-laws kitchen. It was one of those mom foods Mr. Hubby kept craving for until one day I learned it from his mom and ever since it is a regular member of my kitchen too. It is a marriage of aromatic Indian spices with hot and sour flavor that goes into the stuffing and gives a flavor packed food. Although, having cooked my Mom-in-law’s recipe verbatim many times I finally now have my own version of the recipe. The basic ingredients continue to remain the same but I add some coconut powder which I feel sort of balances the tanginess of the lemon juice I use in the filling. Now there, I’ve replaced dry mango powder with lime juice and instead added some dried flakes of those raw mangoes which adds some extra tangy crunch and makes a beautiful garnish. 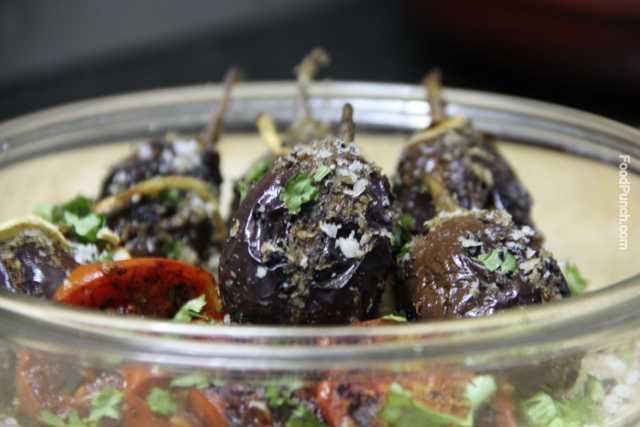 Well, here’s my recipe for the Stuffed Eggplants-Indian Style. Do share your experience if you try it. 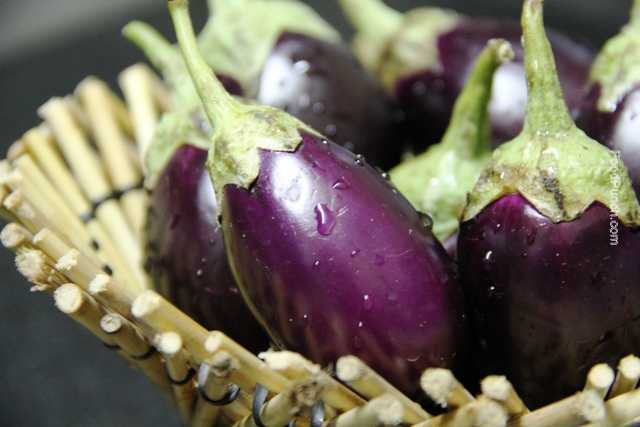 Make a lengthwise incision in each eggplant, sprinkle salt and keep aside. Roast cumin, fenugreek, fennel, coriander seeds over a hot pan and then add the red chili and garam masala powder and remove from the heat once the aroma starts to build up. 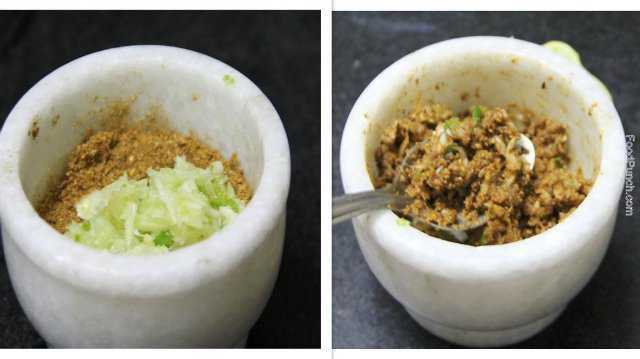 Using a mortar and pestle fist coarsely pestle the garlic and green chilies and keep aside, now in the same mortar coarsely ground the roasted spices , then add the garlic-chili paste, fold the entire mixture together with lemon juice and salt. 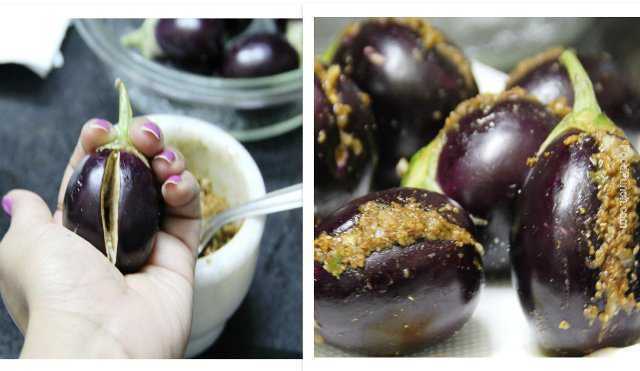 Now pick one eggplant and press top the lengthwise ends between you palm such that the slit opens up a bit, stuff with the prepared mixture using a flat spoon. About 2 teaspoon of the filling should easily go into each of them. Heat 2 tablespoon oil in a frying pan, place each eggplant with the open side upwards, simmer the flame and cover cook for 5 minutes. Then flip sides and cook on each side for a few minutes till the eggplant is tender. Do not worry if some filling spill out to the pan. Just before taking off the heat add 2/3 rd of the coconut powder and entire dry mango flakes, give a toss and strain into your serving dish. 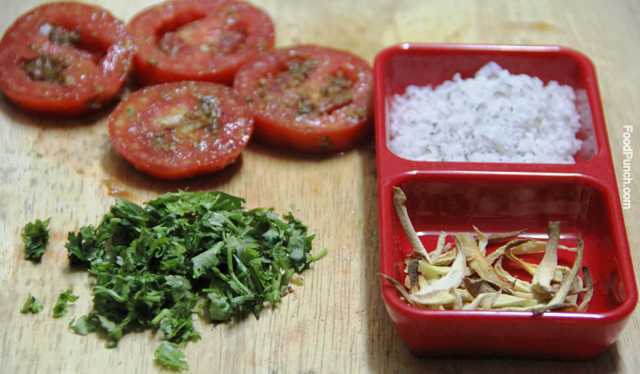 For garnish, Smear the tomatoes in the bowl that had the filling, if none of it is left simply sprinkle little salt and pepper and roast on the still hot pan for only 30 seconds on each side on high flame. 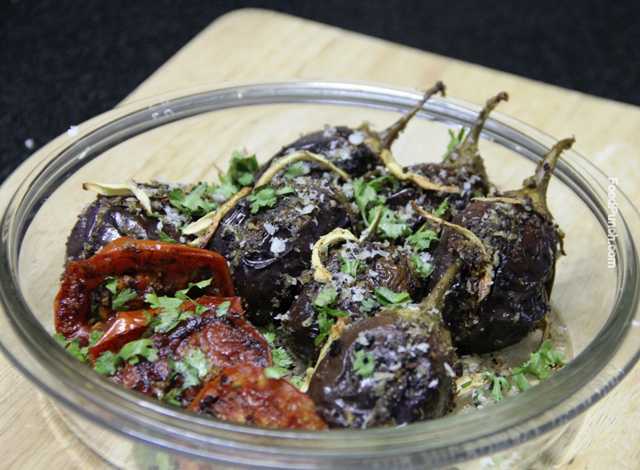 Add these to the stuffed eggplants, sprinkle some fresh coriander and the remaining coconut powder and serve hot as a side with any Indian meal or simply with chapatti. Do replace lime juice with a teaspoonful of dry mango powder ‘aamchur’; in that case you may have to add a few drops of oil to bind the mixture together. 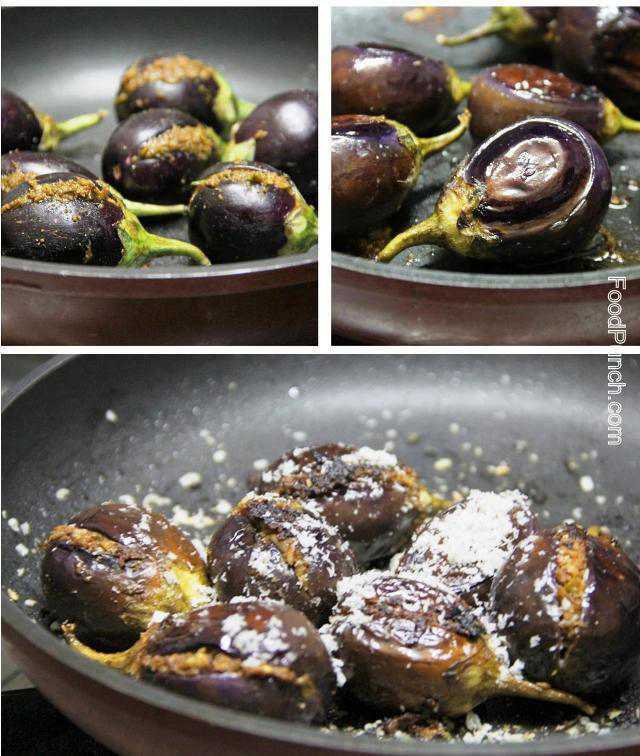 You may simply deep fry the stuffed eggplants if you don’t mind all the excess oil. Don’t forget to sprinkle salt and keep the eggplants aside for some time, it helps drain away the tart taste from that vegetable.